Voila, my inch of creativity today. It’s from Leaves: Three Short Tales, a compilation of three stories I’ve written and am now editing for publication, specifically for Kindle. I have lots of stories awaiting further development and my cunning plan is to publish them in sets of three. Leaves will be the first compilation. This is an excerpt from the first of the three tales, The Second Coming of Judas Iscariot. “What were the leaves like?” Again, he’d no idea where his question had come from. “Shape?” Why am I asking these questions? The hairs stood up on the back of his neck. The Gov was looking like a penny had dropped. 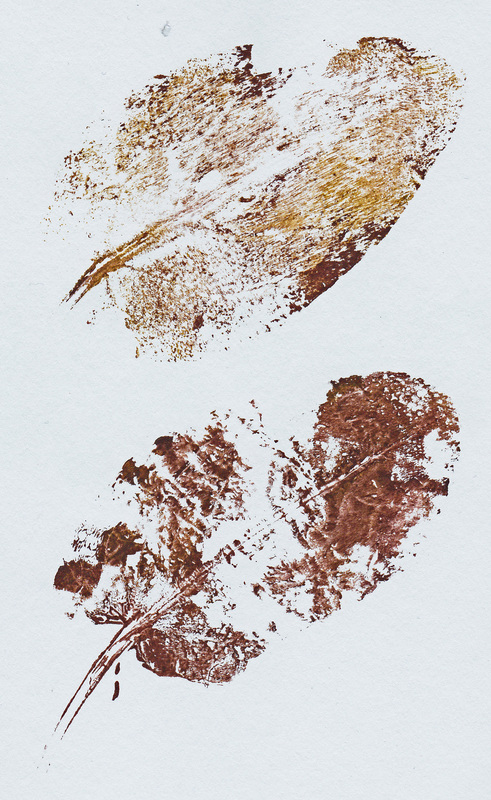 The image is of some leaf prints I did in January. These are prints of sorrel leaves. They are so simple to do. You just brush acrylic paint directly onto the leaf and press it onto some paper. The trick is to get the paint the right consistency and to use a receptive paper. I used cartridge from a cheap sketch pad. It’s a great art activity for kids. Have you added an inch (or 2.54 cms if you prefer) to a creative project today? I’d like to know. This entry was posted in Art, Christian writing, Dialogue, Printmaking, Short Story Writing, Writing and tagged creative writing, Fiction, Judas Iscariot, leaf print, short story, Sorrel. Bookmark the permalink.